Heat oven to 350 degrees. Line two 12-cup muffin pans with paper liners. Place butter in a mixing bowl and beat with an electric mixer on medium speed until creamy. Add oil and sugar. Mix until combined. Add eggs and egg yolk, 1 at a time, beating after each addition. Add vanilla and coffee. In a small bowl mix together 1 cup hot water, cocoa powder, and chocolate. Add gradually to batter and beat until blended. Sift flour, baking soda, and salt into a bowl. Alternately add flour mixture and buttermilk to batter, beating on low speed until combined after each addition. Fill each paper liner with about 1⁄4 cup batter. Bake cupcakes for about 17 minutes, until a wooden pick inserted near the center comes out clean. Transfer cupcakes to a wire rack and let cool. 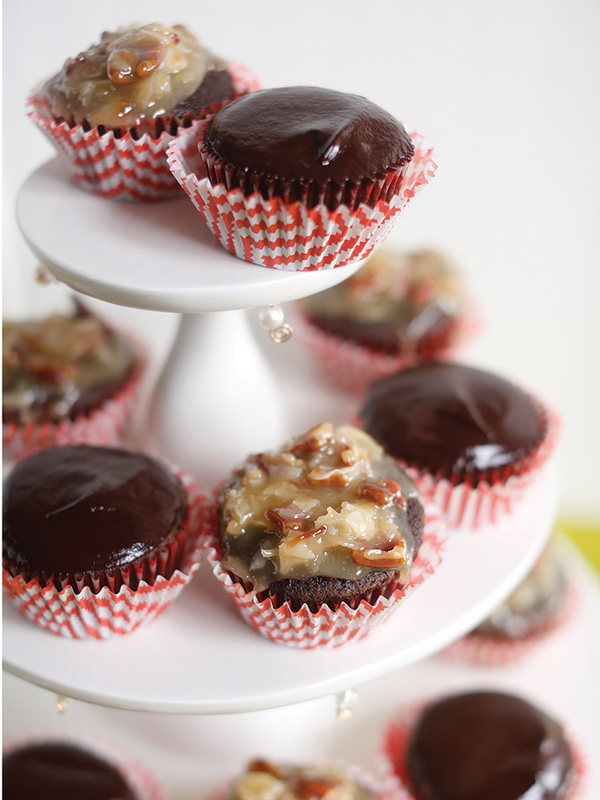 Glaze cupcakes with slightly warm Chocolate Ganache or frost them with whipped Chocolate Ganache or Toasted Coconut-Pecan Topping. Place cream in a medium saucepan and heat until warm over medium heat. Place chocolate in a medium bowl. Pour warm cream over chocolate and let stand for 2 minutes. Whisk until smooth. Pour coffee into chocolate mixture and whisk to combine. Use immediately as a glaze. Alternatively, make a frosting by letting ganache cool for about 1 hour at room temperature and then beating it with a hand mixer until light and fluffy. To glaze cupcakes, dip them into slightly warm ganache. To frost cupcakes with whipped ganache, spoon thickened ganache into a gallon zip-top freezer bag. Snip a 1⁄2-inch tip from corner of bag. Pipe whipped ganache onto cupcakes. *Note: For a dark chocolate ganache, substitute bittersweet chocolate. Evenly spread 1 cup coconut on a baking sheet and bake for about 5 minutes, until golden brown, stirring halfway through baking time. Combine coconut milk, sugar, and egg yolks in a medium saucepan. Cook over medium heat until thickened and almost coating the back of a spoon, about 15 minutes, whisking constantly. Remove from heat and stir in vanilla, toasted coconut, remaining 2 cups shredded coconut, and pecans. Let cool and thicken at room temperature, or spoon into a bowl and refrigerate. Slightly warm topping before frosting cupcakes. To frost cupcakes, spoon topping onto cupcakes. Serve immediately. Use Toasted Coconut-Pecan Topping as a frosting for carrot, spice, and hummingbird cakes.